The continued story of my first trip to South Africa. I have posted about my trip to South Africa and my road trip to Sun City. That could not prepare me for the culture shock of going to Soweto. On Saturday July 25, 1998, I went on a tour of Soweto. That was an unbelievable experience. Entering Soweto we were stopped by police who chatted with the driver of the van I was riding in. Just a standard procedure I was told. Sometimes stolen vehicles are stopped but if the policeman is corrupt he will accept cash and allow the driver and car to pass. As a note, I found out that 2 months after I left South Africa armed robbers stopped the tour bus I had been on and robbed the passengers at gunpoint. Soweto has a population of 3.5 million with a mix of 9 tribes as its inhabitants. Many of the people of Soweto can speak up to 4 languages including English. Everybody gets along much better now, with local communities dealing with crime in their own way. Calling the police will normally mean the perpetrator being back on the street in hours. In the past, under apartheid, government informants were given several warnings by the Soweto community before being given a “neck lacing”. That consisted of a tire soaked in petrol placed around the victim’s neck and set a light. Sometimes the victim is made to drink the petrol as well. This could be done to a 12-year-old as well as an adult! Rapists are put to death and other criminals are tied to the ground spread eagle and beaten on the behind with a stick. There are reservoirs here that contain sulfuric acid and arsenic that are a by-product of gold mining. A criminal that is to be put to death by the local vigilantes might be taken to one of these earth damns, shot and then dumped into the pit. Our driver said that crime in Soweto was not very bad at all. 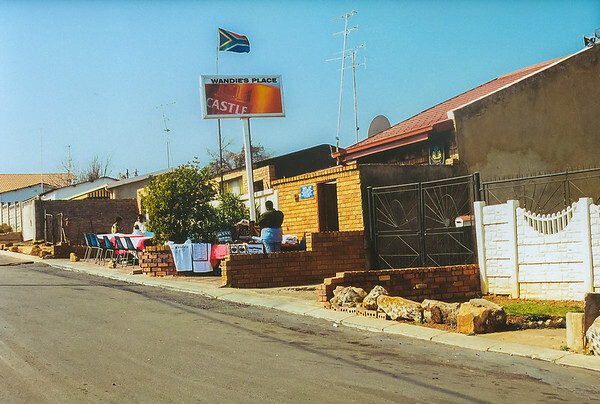 While in Soweto we first drove by the homes of Nelson Mandela and Winnie’s mansion. The area is called Beverly Hills. 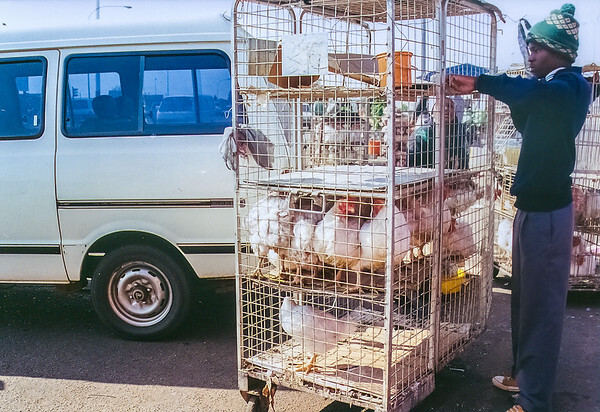 We went to a large open market where chickens were being killed, cooked and sold on the street corners. African medicine and herbs were also being sold along the roadside and one fellow was inspecting a handful of marijuana! Grills would be cooking up a local meat and the cook would occasionally turn around and re-leave himself while cooking. This is near the largest hospital in the Southern Hemisphere the Chris Hani Baragwanath Hospital. We also visited a squatter site where 12,000 people live and have only 90 port-a-johns. The city does not allow squatting but does supply running water. There is no heat and many buildings are made of metal. Trucks stop by the edge of the shantytown and sell coal for cooking and heating. Needles to say the shacks are extremely hot in the summer and extremely cold in the winter. I actually walk the muddy streets of this area and could not help but feel sad for just having nice shoes and clothes. The smell was exactly that of a barn containing animals. You see small businesses being run from steel shipping containers. These containers are also used for public telephones. It is a very strange sight. There is high unemployment here in South Africa in general and Soweto specifically. I guess maybe 30 percent. Plus there is a type of affirmative action going on here in SA similar to the 70's in the US. The poor people do different types of things to get money. Of course there is the old tried and true methods (crime and prostitution) but there are also little businesses setup on many street corners not just the steel containers. Not everybody can afford even that. Muffler shops (several mufflers complete with all pipes) propped up on a phone pole, painted silver and 4 ramps to drive your car up onto along side the road. Used clothing lying on the sidewalk for sale like a yard sale. On our way back to the hotel we visited a "rich" and "middle" class area of Soweto. The middle class was what we would consider poor. They make on an average R12,000 a year (about $4,00/year in 1998). The rich lived in what we might consider upper middle class. We also visited a Soweto restaurant that was once an illegal Shebeen (selling food and drink without a licence). There were African dishes available but we did not eat there in fear of getting a stomach virus. We did have a cool drink of water and survived that! It was probably safe to eat there but better safe that sorry. This particular tour was unlike any other I have ever taken and probably ever will. It was both sad and yet at the same time uplifting, because you could see the pride the women took in what they had. Laundry was hangout to dry and the one and two room shanty homes were kept as clean as they could make them.